I have been investigating the symbols used by secret societies and mystery cults to try and establish the existence of a hidden seam of golden knowledge about the Dark Star. My premise is that these symbols are very ancient, and have survived the ravages of persecutions down the years, as monotheism and dogmatic religious authorities have attempted to stamp out the old teachings. We now live in more enlightened times (one would hope), and the secret esoteric symbols have been gradually emerging from their shells. However, the guardians of these teachings have really no better idea of what they mean than any of the rest of us. The esotericists have interpreted these symbols, it is true, but these interpretations are more a reflection of their modern spiritual values than those of the ancients themselves. Many might disagree with this view, but I start with this as my initial premise. In DarkStar19 I began an examination of Alchemy and showed how a standard astrological interpretation of this esoteric school of thought leaves a lot to be desired. 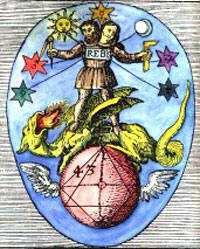 I will soon release alchemical images that show clearly the role of Nibiru as the Messianic Star, or the Dark Sun. On this page I will show more of the alchemical images (1), but with the onus upon Freemasonry, another secret society that appears to hold promise for this research. This 16th Century image (right), for instance, seems to show a red fiery globe, among a field of 7 stars (its moons? ), between the Sun and Luna (2). Clutching this globe, the alchemist appears to be moving onto solid ground, perhaps even moving between planets...Note how the coronal discharge of the red orb is swept back from the Sun, as one would expect when the brown dwarf's coronal discharge interacts with the Solar Wind. This is the origin of the appearance of the Winged Disc during Nibiru's perihelion passage. 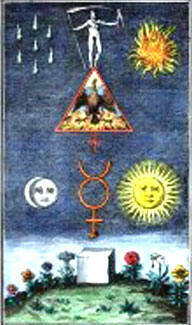 The Freemasons have a tremendous interest in a 'Blazing Star' that is said to represent Sothis, or Sirius. They have this Star motif placed in prominent places in their Temples, or Lodges. Many of their rituals are derived from Isian rites, and ancient Egyptian symbols feature strongly in the Craft, even though many of their degrees are actually Mosaic, or sometimes Christian, in character. There is emphasis placed upon the appearance of a bright light in the darkness, derived from the 'Black Rite', described by Isis in 'The Virgin of the World'. This celestial entity known as the 'Night' "weaves her web with rapid light though it be less than Sun's" (3). The equilateral triangle is an important symbol for Freemasons also. Matthew Scanlan has described the Triangular Lodge of Rushton in Northamptonshire and links much of the symbolism used within its architecture to alchemy (5). (I am particularly impressed by a motif of the 'seven eyes of God within a hexagon (sic)' on the building). The Equilateral Triangle is one of the oldest of the sacred symbols, according to James Churchward, and represents the Trinity or the Triune Godhead: "Whenever or wherever this symbol is found, in any form of record or inscription, it is either in reference to, or represents, the ancient Trinity and Heaven...The Truine Godhead of the Egyptians consisted of "Shu, Set and Horus" (6). So the Freemasons have inherited a very ancient series of symbols, and Alchemy demonstrates that this Masonic equilateral triangle has some sort of celestial significance. It is often shown with an enclosed eye, the 'all-seeing eye of Osiris' according to Churchward, who notes that this combined symbol was often seen "in ancient Catholic churches, over the main altar" (6). Americans will be very well acquainted with this symbol, as it is part of the Masonic imagery shown on their One Dollar bills. Burgoyne also had a lot to say about reincarnation, it appears. But it is the vital connection with 1881 that correlates with the theory I have been developing over the last two years. Let me offer you a very remarkable synchronicity about 1881, and you can judge yourself whether the Dark Satellite is simply yet another re-interpretation of the ancient knowledge of the Dark Star. I have extended this idea to propose that the last Nibiruan passage marked the beginning of our current era, and that the appearance of the Messianic Star was actually the dark star Nibiru moving through the planetary zone. Nibiru's alleged orbital period of 3600 years was a Sumerian approximation to neatly fit into their sexagessimal system, and appears to be about 3750 years in reality. As such, our calendars have begun with Nibiruan appearances, each time marking the start of a new Nibiruan Age. The exact chronology is less clear, because the appearance of the Star might have been in the years preceding 1AD, for instance, and the Jewish count of years might be slightly askew also (3756BC has been suggested). But in previous centuries this was not appreciated, and the dates of 3760BC and 1AD were pretty much set in stone. This image is a tracing board 'designed to serve the initiation of the Entered Apprentice' (8). The Stairway to Heaven sought by the Freemason appears to ascend to a seven-pointed star in the East. The seven stars that are becoming remarkably familiar appear to be offset, grouped with Luna. This may be because of their ancient connection with the upturned crescent, but they nevertheless make their presence felt even here, in the standard symbolism of Freemasonry. So, can be it be coincidental that this 'turning point' in 1881 represents exactly half a Nibiruan Age? Half of 3760 is 1880, and if you take into account the lack of 'year zero' in the Christian Calendar, we have 1881AD for Nibiru's furthest distance from the Sun, or its 'darkest culminating point' as the Rosicrucian Burgoyne would have it. This is the year that it was expected to commence its long return voyage to the planetary zone. The eternal eye dominates the celestial backdrop, dwarfing the Sun and Moon. The Masonic Eye appears to be underlined by a crescent shaped wavy line, and radiates outwards. Within the aura of this celestial image can be found seven stars. This appears to me to be a fairly straightforward Masonic rendition of the Dark Star Nibiru and its seven moons. "In technical terms, it is the arch of the ecliptic which rises visibly in the heavens as the pathway of the Sun, and which is marked in some diagrams with the first seven segments of the zodiac, from Aries to Libra, as they emerge into the 'light of day' (8). The central constellation highlighted by the Arch is that of Cancer, the 'Gate of Birth' into the higher realm. It is also the constellation through which Nibiru brightens as it enters the Duat at perihelion. The Duat is found below the Arch, in the south, between Leo/Cancer and Taurus/Aries. So is it any surprise, therefore, to find a cometary Star and seven smaller stars at Nibiru's perihelion position in this Masonic image? Given the other revelations about Masonic lore and Nibiru covered here, then perhaps it should be no surprise at all. The American Freemasons appear to have inherited the ancient symbolism of a Dark Star Cult. They may not like this explanation, but it seems that the Star of the East they revere is none other than Nibiru. I have a final suggestion to make about the symbolism incorporated into the regalia of the USA. During these last few centuries while Nibiru has been near aphelion, its lateral movement across the sky has been almost negligible year on year. It is essentially a fixed object with respect to parallax effects, and would have a stationary position against the field of stars in the sky. This is why it is so hard to find, particularly as it lies in the massive star-field of the Milky Way. The constellations opposite the Duat are Aquila and Ophiuchus. Aphelion occurs in Aquila, the Eagle, marking its most distant point from the Sun. This is the constellation Dr Murray suggests for his brown dwarf in the Oort Cloud (11). So during the period of time when America was founded and rose to power in the world, Nibiru has been in the constellation of the Eagle (it might by now be in Ophiuchus, where Voyager 1 is heading). (12) So what better motif than that of the Eagle for this emergent world-power? This image shows the interior of the Lodge De Goed Hoop Temple (Lodge of Good Hope) in Cape Town, South Africa (14). Note the five-pointed 'blazing star' which is flush with a red aura. Of more interest however is the Moon icon, which is replete with seven small stars. Again, I think the red crescent of Nibiru's coronal discharge at perihelion has become integrated with the crescent moon down the centuries, leading to the seven stars being depicted with the Moon, not the 'Blazing Star'. It's difficult to imagine why the seven stars would be so often associated with the Moon otherwise. I suspect the 'Blazing Star' is the conjunction of Nibiru with Sirius at perihelion (See HERE). We first considered the Crescent and Seven Stars icon with the 'Talisman of Orpheus'. 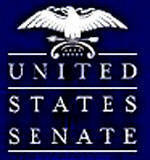 It is not an uncommon symbol, it seems, but its importance has not been recognized previously. On this gravestone the same symbolism is deployed in an evidently Masonic context. This is the Brierly Tomb at Mellor, Greater Manchester, England (15). The Angel and the Mason are both pointing in the direction of this curious motif (circled), which is found close to Aries on this occasion. The Mason appears to be stood upon a five-pointed star (Sirius), and a ladder extends towards the Crescent and 7 Stars (a Stairway to Heaven?). In his article, the Rev Parker amusingly notes how Masonic imagery found on the architecture of churches is often put down to a tribute following the accidental death of a Mason falling from the roof. 'Mason's set square' at Gloucester Cathedral is given as an example...an incongruity I can investigate in my own town! The masonic button on the left is the earliest known, dating to 1763 from the Regularity Lodge No 91 (United Grand Lodge, London) (15). On the left below is a Masonic medal showing the radiant triangle at the top. It is surrounded by a semi-circle of discs, numbering seven. The medal was awarded for charitable work, but the imagery employed also hints at Jesus/Mary or Horus/Isis. This Scottish Lodge (St Bryde No 579) boasts a Blazing Star that appears very much like a classic Winged Disc (16). One of the things that I find very interesting is the presence of the two pillars. These no doubt symbolize the two pillars upon which Knowledge was written prior to the Flood: one could withstand the destruction of the Deluge, the other was capable of surviving a fiery cataclysm (one wonders whether the excitation of Nibiru as it approaches the Sun is reciprocated; that the super-charged Sun might cause massive global over-heating during some perihelion passages). We have seen the two pillars deployed in alchemical images also, and it is possible that their presence may indicate an archeo-astronomical significance. In other words, the appearance of the Winged Disc is meant to be seen between two marker pillars, or obelixes. Speculative Freemasons certainly show much interest in related Egyptian relics. Martin Cosnette dug up this little gem for me. Apparently, according to David Icke's website, this was the very first American flag (17). The original Stars and Stripes in the form of a comet and accompanying set of seven stars! It contains all of the relevant symbols associated with Nibiru, the Dark Star. There is the massive comet containing the Eye (of The Watchers, or Nephilim?) and the seven accompanying stars, or moons. Quite remarkable. So were the founders of the USA knowingly presenting the image of the hidden Dark Sun as their own? This is a black and white image, and one presumes that the color of the field on the left is blue, and that on the right is red. As we have seen above, the creation of the United States of America involved a significant number of Freemasons, George Washington most prominent among them. The flag shown here could have easily been derived from symbolism deployed on the Lafayette Apron, which was presented to Washington himself. Freemasons themselves have put forward explanations for the symbols, but add that no interpretation can be considered absolute. 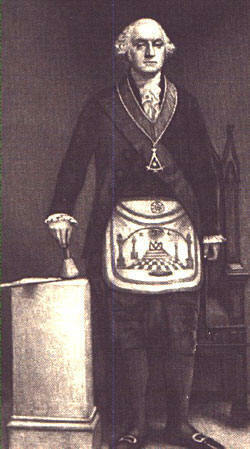 The following is derived from work by Frank W. Bobb, Grand Lodge librarian and curator at the Grand Lodge Museum in Philadelphia, where the 'Washington Apron' is kept. Prominent among the symbols is the All-Seeing Eye, a symbol of 'watchfulness and of the Supreme Being' (number 4 in right image). It is a third astronomical symbol, independent of the lesser sources of light provided by the Sun and Moon. This 'God' of the freemasons is emblazoned with fiery radiance, within which can be found the Seven Stars (number 40 in right image). 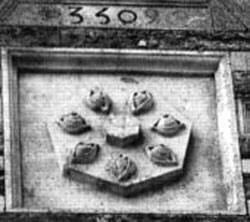 These are said to represent the seven Liberal Arts and sciences of the Freemasons. In this sense, then, the All-Seeing Eye is the fount of Masonic knowledge and learning. But this interpretation provided by Frank Bobb may be just conjecture. For me, personally, the overall imagery is absolutely identical to that of Nibiru and its moons, and found as it is with the Sun (number 39 in right image) and Moon (number 7), and the Arch of Heaven (number 6), an alternative meaning can be presented. Did the Freemasons know about Nibiru through esoteric and hidden knowledge passed to them from older, persecuted Orders or heretical sects? Was this hidden knowledge so central to their secret system of beliefs that it was used by Washington and his colleagues to create the flag of the United States of America? It's an amazing thought. "You can also see this flag (top image) in the book: 'The Gods of Eden' by: William Bramley. He says it was only a 'runner-up' to the first official American flag. Still very interesting though. "Thought you might be interested in this prologue (pg. XIII) from the book 'Uriel's Machine' by: Christopher Knight & Robert Lomas, � 1999. "According to the two Authors Freemason rituals of the ancient Scottish rite devoted entire Degrees to 'Enoch' himself who was told by an angel, called Uriel, to preserve the secrets of civilization because a global century, known as the 'old charges' tell how everything dear to mankind existed before the disastrous Flood and had to be reconstructed by the survivors. "On page 55 in the book the Authors go on to say that, according to the 'Book of Enoch', he had a vision of seven stars that appeared as "Seven burning mountains" descending upon the Earth and the 'Tollmanns' interpreted this later as seven Cometary fragments that hit the Earth causing the Great Flood in Noah's time! Regardless if the "Seven Burning Mountains" impacted the Earth or not, it is clear to me that the seven stars were associated somehow with a celestial event in which Enoch was 'allowed' to view. "Therefore it is my conclusion, like you, that the Freemasons are privy to certain hidden knowledge regarding this celestial event (Nibiru) and the seven stars or "Burning Mountains" on the early American Flag is a great example of this. And as you well know these seven stars show up throughout Masonic symbology." "Uriel's Machine" is a fascinating book, and the excerpts pointed out by Greg Jenner do make for very interesting reading. They provide a direct link between a description of the Dark Star and its satellites at perihelion, and myth connected with catastrophic Earth changes. 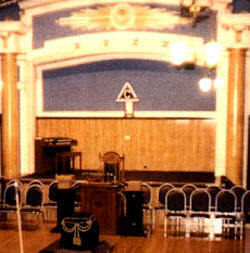 This page was recently included on a detailed web-page devoted to all things Masonic. It is run by Br. Roald Atle Furre of Oslo in Norway, and the link is included under 'Masonic Education'. Thanks Roald! A little unexpected given that I am not even a Mason, but I know my Dad will be proud. http://masons.start4all.com "A Must 4 Masons Worldwide". For any Masons perusing this page you may also be interested in another small essay on the Dark Satellite. 4. Sixth woodcut from the series in Basil Valentine's Azoth. 7. 18th century engraving based on work of Basil Valentine.